San Francisco, CA -- Northern California Grantmakers today released a report examining the effects of the 2017 North Bay Fires on the arts communities in three counties. Commissioned with funding from the William and Flora Hewlett Foundation, the report finds that artists have been profoundly impacted by the fires, due to physical and economic loss as well as emotional trauma, with the impact of the fires disproportionately felt among arts organizations serving communities of color in the region. 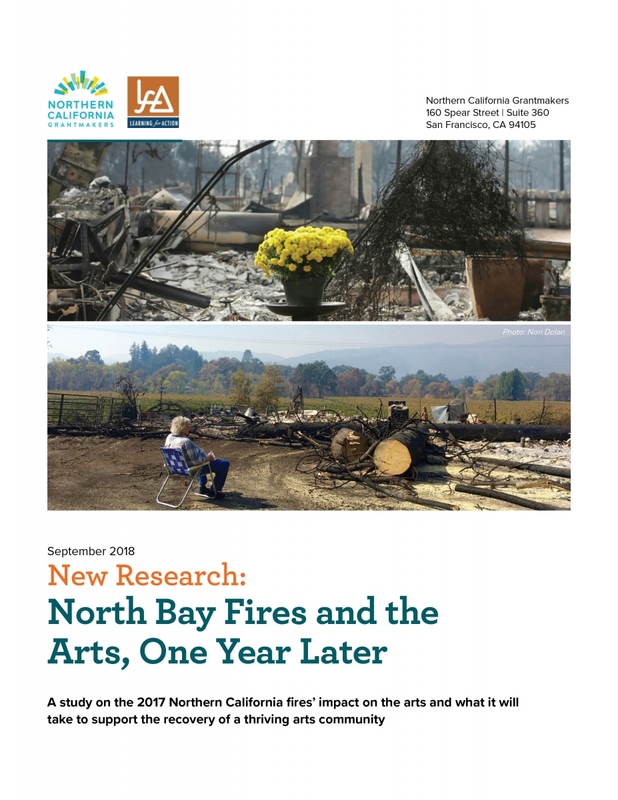 “North Bay Fires and the Arts, One Year Later” aims to supplement other research on the full scope of the fires’ impact in the region and provide recommendations for funders interested in supporting the North Bay arts communities. Compiled by Learning for Action, the report finds that more than half of arts organizations have seen a decrease in earned income; nearly two thirds of artists affected by the fires lost their studios completely, and over a quarter lost their homes, studios and work places. Financial and organizational impacts of the fires have affected organizations serving communities of color at substantially higher rates. For example, the median estimated financial loss for organizations serving communities of color is more than three times larger than the same loss across all organizations. While organizations continue to make ends meet, they report that donor fatigue and long-term sustainability in the wake of the fires is a primary concern. Nearly three quarters of organizations have seen no change in support from government or corporate sponsors since the fires. Housing is of primary concern to artists and arts organizations; participants named that they have seen staff, the populations they serve and artists leaving their communities due to a shortage of housing further diminished by the fires. The fires, which began in October 2017, destroyed at least 8,900 structures across 245,000 acres. The blazes destroyed the structures of dozens of businesses, though its impact on the economy was far broader and many communities are struggling with recovery and planning efforts across the area. [Sources: East Bay Express, NorthBay Business Journal]. Similar to other communities and industries in the North Bay, there is uncertainty among arts organizations about the long-term implications of the fires, particularly on earned revenue and donations, making it difficult to determine what will be needed moving forward. General operating support is a first priority, and participants ask that funders recognize the importance of supporting whole organizations and the need for capacity building support, whether through skill-building trainings, workshops, coaching, technical assistance, or from more opportunities to connect and form partnerships. The report was informed by a survey of 98 individual artists known to have experienced some level of loss, 39 arts organizations in Sonoma, Napa, and Mendocino counties regardless of known impact; and in-person focus groups with these individual artists and all organizations and businesses with an arts focus in these three counties. Carolyn Wang Kong is the Chief Program Director at the Blue Shield of California Foundation. As a part of our Member Spotlight Series, Carolyn spoke to us about where she is seeking collaboration, why time travel would be her ideal superpower, and details on her favorite guilty pleasure. It’s Spring and we found fresh takes on enduring subject matters. The April edition of What We’re Reading encompasses a range of articles tackling bias, revising what we’ve been taught in school and society, and opening up new perspectives.